Dog toys and cool gadgets. Pond Pumps, Air Pumps and Heat. 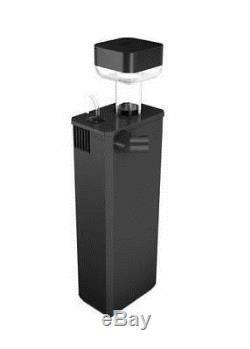 JUWEL AQUARIUM SEASKIM MARINE PROTEIN REEF FISH TANK SKIMMER ECCOFLOW PUMP SKIM. 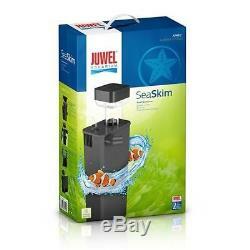 Juwel Aquarium SeaSkim Protein Skimmer. The JUWEL Skimmer ensures highly efficient protein skimming in all aquariums with a volume up to 500 litres. &###xA0; The low-noise and powerful Eccoflow SeaSkim 1500 pump ensures the formation of extremely fine bubbles and therefore guarantees effective protein skimming in your saltwater aquarium. The skimmer cup is generously sized and easy to access. This guarantees simple cleaning even during operation. Skimmer Cup- Large foam chamber for long standing times and ease of use. O2 Control- Continuously adjustable oxygen supply for optimum setting of the foam moisture. Top Clean- Surface inlet with protective grill ensures a clean water surface. O2 Infusion- The finest air bubbles ensure optimum skimming results. Eccoflow SeaSkim Pump- Highly efficient and whisper-quiet Eccoflow SeaSkim pump with double-mounted ceramic axle. Easy access to all control elements- all operating elements are easily accessible on the top of the skimmer. The air controller and the water pressure controller enable ideal adjustment of the SeaSkim protein skimmer&##xA0. Easy installation- The innovative retainer guarantees easy installation of the skimmer during servicing activities or operation. Safety first &###xE2;&###x20AC;&###x201C; the water remains in the aquarium! All components of the SeaSkim are integrated into the housing and there are no hose connections that lead out of the aquarium. Therefore, it is the safest way to operate a protein skimmer. Compatible opening in the cover for mounting in all JUWEL aquariums. All of the aquariums in the Rio, Vision, Lido and Trigon lines already&###xA0;have&###xA0;the matching opening in the cover and are therefore ideally prepared for saltwater operation. Unfortunately couriers pass on aditional shiping charges for these locations which we have to pass on. If an item over the specified value/weight is ordered to one of these locations, you will be subject to a &###xEF;&###xBF;&###xBD;6.90 surcharge from our courier. Our website features an extensive online Help section which covers all eventualities with orders; together with easy to complete forms to enable us to address any problems in as quick an efficient a time frame as possible. The item should be in an unopened and unused condition and you should notify us within 14 days that you wish to return the item to us. The item "JUWEL AQUARIUM SEASKIM MARINE PROTEIN REEF FISH TANK SKIMMER ECCOFLOW PUMP SKIM" is in sale since Thursday, April 16, 2015. This item is in the category "Pet Supplies\Fish & Aquarium\Filters". The seller is "aquacadabra" and is located in bexleyheath,kent. This item can be shipped to United Kingdom, United States, Japan, Canada, Ireland, Australia, Germany, France, Greece, Italy, Spain, Russian federation, Austria, Belgium, Bulgaria, Croatia, Cyprus, Czech republic, Denmark, Estonia, Finland, Hungary, Latvia, Lithuania, Luxembourg, Malta, Netherlands, Poland, Portugal, Romania, Slovakia, Slovenia, Sweden, Brazil, New Zealand, China, Israel, Hong Kong, Norway, Indonesia, Malaysia, Mexico, Singapore, South Korea, Switzerland, Taiwan, Thailand, Chile.